Gentle reader, you must promise not to tell my wife what I am about to confess to you. 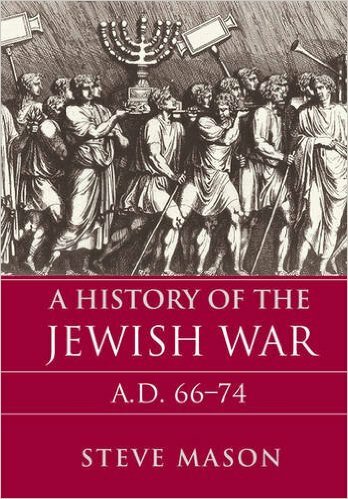 Yesterday I threw thrift behind me and recklessly purchased an electronic copy of A History of the Jewish War, AD 66-74 by Steve Mason. And I do not regret the guilty pleasure. If even those who understand themselves to be historians and nothing else differ significantly in method, the potential for disagreement over aims and methods is likely to be all the greater in this field. On top of that lie all the potential stakes in this period held by Jews and Christians of various kinds, religious and non- and anti-religious scholars, Zionists, post-Zionists, and anti-Zionists. So the excised chapter was replaced by a shorter discussion in his second chapter, and I would love every biblical scholar and theologian who thinks she or he is a historian yet who has never read R.G. Collingwood or E.H. Carr. Too often I have seen a theologian mocking what he calls an old positivist view of history yet ironically failing to realize that he only has a superficial grasp of what historical positivism really is. I myself have been lampooned for discussing the problems raised by E.H. Carr for historians by theologians who only know that Carr had communist sympathies and accordingly seem to think that anyone who refers to him must be seeking to undermine every good and decent value in modern society. But here is Steve Mason discussing the problems facing historians as they are addressed by Carr. To get to the point: Mason explains the importance of first knowing and understanding what our sources actually are. A historian cannot simply read Josephus, for example, at face value. One must understand the type of world that had produced him and the type of writing he has given us. One must understand the worldview he shares with his contemporaries. And one must understand why he wrote the way he did and what he did. Moreover, one must understand what history is and what it is not. The past is dead. It is gone. It no longer exists. So how can we know anything about the past? The past is not a set of facts that exist “out there” and that the historian can look at and talk about. The past really is dead. It is not preserved in some sort of hologram or series of floating imprints for our imaginations to look at and learn. What we read in history books are the creations of historians. Creations. I hesitate to use the detective analogy because it has been done to death before even though it is very often misapplied or misunderstood or not understood nearly well enough. All detectives start with some known facts that are indisputable. A cadaver with a knife in its back, a diary of a missing heiress, invoices and tax records. They then seek to uncover more evidence from these established facts. Interviews are recorded and attempts are made to independently corroborate them, etc. But if detectives work like historical Jesus scholars they would not work like this at all. They would read a few popular anonymous publications about a long-ago murder at a nearby uninhabited hill that locals believed to be haunted. They would dismiss most of the anecdotes about hauntings, but they would study the publications to try to determine who the murder victim was and what was the motive for his murder. That’s from an older post of mine. In other words, far more often than not, scholars familiar only with biblical studies all too often do not understand the relationship between their sources, the events narrated in them, and what really happened. Steve Mason, at least as far as I have read since yesterday, does understand. I feel like I am reading the work of a “real historian” so rare in this particular field of research. I hope to be able to share my guilty pleasure over coming months and longer as time and opportunity are both kind to me. Today, or whenever Thursday 4th August catches up with you, is, according to my Facebook reminder, Earl Doherty’s birthday. Earl has had a major impact on the understanding of many people about Christian origins whether or not they agree with every detail. And even among those who flatly oppose his views he managed to ruffle feathers and raise concerns over the questions many more people are asking. Some years back in personal exchanges with Earl I found my awareness of the need for constant testing of one’s ideas against logical validity and evidence becoming increasingly honed. I was especially inspired by the grace, cool calm, sharp logic and vast knowledge of the scholarship and sources that he applied in his first foray into discussions with biblical scholars on Crosstalk despite the unprofessional responses of a few names there. Everything he has written on Christian origins is worth reading and thinking about. And I am particularly grateful for him introducing me to Vardis Fisher’s Testament of Man series of novels (a graphic sits on the top right corner of this blog), from which I branched out to further read Children of God. Anyway, enough of the speech. Have a great day, Earl. A prominent social researcher Hugh McKay was recently discussing the topic “Spirituality in a secular age” and claiming for the word spiritual a whole lot of stuff that I think surely belongs to chemistry, biology and various other specialist branches of science. At one point McKay acknowledged that to some people (he must have been thinking of me!) 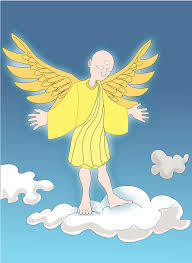 the word “spirituality” has become as debased and meaningless as the word “organic” today. I do agree. Is not our propensity to find meaning in “something bigger than ourselves” an extension of the contingencies of our very social nature. I doubt too many would consider our sense of identity with our families, local communities, ethnicity, gender, various other groupings (military, workplace, school, sports teams, political party), our nation, our species ….. as “spiritual”. But no, I’m jumping ahead here. Some people really do use “spirituality” to describe a person’s sense of one-ness with humanity. When asked about my “spirituality” I used to say I believe in poetry, in metaphors, to describe very “physical” feelings of awe and wonder. Why not? No doubt the most “awesome” emotional experiences can all be identified via a CT scan. It’s just one of those things that pushes the button that causes my eyes to roll.